Curious to hear about anyone else’s recent experiences with Auckland Council (or other TAs) regarding cladding systems? I haven’t managed to get hold of Ed Claridge as yet for his final word, but one of their reclad team is saying that we may have to build an entire exemplar assembly for testing? (including fixings, glue, tapes etc…) This would be totally impractical to require this for all Consents (or even just the larger buildings) given the thousands of possible combinations of products…I understand the nervousness especially after Grenfell… but surely not? I am glad you raised this as i am currently working through exact same design issue with an Architect for cladding for multiple new building project. (The design has yet to go to Auckland Council for consent). Starting with Clause 5.8.1 of C/ASx the definition of the specific term ‘external wall’ in C/ASx documents gives a general description of its function. However where the fun begins is that Clause 5.8.1 also uses the term ‘Cladding system’. Cladding system in C/ASx is not a defined term (not cited in italics) however it is a defined term in NZBC Handbook (page 115) therefore it is a defined term even if not cited as such in C/ASx. The Handbook definition gives a very detailed description of what a cladding system is. This term is also cited in Appendix C Clause C7.1 for testing of external wall cladding systems. My interpretation of ‘cladding system’ in the context of Clause 5.8 means that compliance applies to the whole exterior cladding system including cladding, underlays, cavity components (including battens), windows, doors and all penetrations, flashings, seals, joints and junctions. The testing requirement applies to all components within the cladding system. Like you I wonder how we are ever going to comply with this requirement given the multitude of products that could be used in the assembly of a ‘cladding system’. Full scale testing is an option but simply not practical. The other options are testing of each individual component as per ISO 5660:1 as per C7.1.1 and C7.1.2 or using only non-combustible materials for each component of the system (ref Clause C7.1.4). For cladding systems comprising a drained cavity there is the additional complication of complying with Clause 4.15.3 to prevent vertical fire spread. We have test certificates for the three main elements (Eterpan, Xpressclad aluminium rails for cavity & Fibrecement board exterior cladding), and I’ve informed the client they’ll need to prove to me that the glue will comply also so as to maintain the fire rating . The timber frame will be protected by fyreline GIB on inside and Eterpan on outside, stud sizes/centres etc as per BRANZ appraisal. My intention is to provide a statement in our fire report that the system is likely to comply with NZBC when referring to the test certificates for each of the three main elements as well as BRANZ appraisals which specify/discuss the fire rating. Just a couple of tips to be aware of that are tripping people up. Sprinklers will of course help if there are any issues with the above. In the determination it revolves around the variation of as-tested construction to the NZ as installed/ designed construction. From a recent discussion with a cladding supplier, in the US they use Type X plasterboard with a waterproofing membrane paint for the RAB vs NZ where we would use a fibre cement board and timber framing. I would not have thought that a strip of silicone sealant on a join or aluminum/ mylar flashing tape on a join would provide enough of a fuel load or area to be important for the issue - being fire spread of more than 3.5m above the window. For those with more expertise in the subject fo cladding fire spread, if a system had a test to BS 8414 (https://www.designingbuildings.co.uk/wiki/BS_8414_Fire_performance_of_external_cladding_systems)) and video BRE BS 8414 test, which is an intermediate scale test, would this be (likely) to be approved as an alternative solution, since this test is not in the compliance documents? One issue from a discussion with a cladding supplier yesterday is the same as the determination - the BS8414 test of this particular product was over concrete, so would fibre cement board “work”? No one tests as we build in NZ, with fibre cement and timber framing. Many thanks for your response Geoff, yes I did read 2017/088 with great interest as it came out just as this was becoming a big issue for two of my clients. I am still going through it at present. Thanks Geoff for sharing the information. As one of the determination participants representing the cladding supplier I will provide my summary for those that do not want to wade through all the documents. The determination itself gives a pretty good account of the factual imformation that came to light through the determination process. I have written this with the assumption that you have already read the determination. Some of the bigger picture questions were left unanswered in the determination and this was in part due to the fact that determinations have to revolve around real projects and real clients that have commercial pressures to deliver projects on time and to budget. Therefore we ended up focusing on what was necessary to complete the determination and obtain a building consent rather than iron out the bigger issues. The determination arose because the cladding supplier had a cladding system that had been tested to NFPA 285 and passed on two occasions. However as we probably all know, we like to build our buildings in New Zealand differently from the rest of the world. Sometimes this is good and sometimes not. I was tasked with reporting on whether the proposed construction method in New Zealand was equivalent to the NFPA 285 test method and would therefore comply. There were some differences in the way the panels were fixed to the aluminium rail system and this was modified slightly during the determination process to provide greater confidence that it would be equivalent. However the biggest difference was in the base wall construction. In NZ timber studs with RAB on the outside and plasterboard on the inside is very common whereas the NFPA 285 test used a steel stud wall with 16mm fire rated plasterboard either side. In my first report I took the simplistic view that fibre cement RAB which is used in fire rated wall systems would be adequate to prevent any interaction between the base wall construction and the ventilated cavity temperatures that contribute to the NFPA 285 pass fail criteria. During the determination process I was challenged to justify this view and discovered after further research that when fibre cement RAB is used in fire rated systems and exposed to the fire, it cracks early in the fire and exposes the timber studs which catch fire. When the fire is only on one side of the wall, the lining on the other side, whether it be fibre cement or plasterboard maintains its integrity and insulation long enough to achieve the fire rating. However when the wall is exposed to fire on both sides simultaneously as in the NFPA 285 test the cracking becomes important because the flaming studs contribute to the heat buildup in the ventilated cavity and influence the outcome of the test. How much influence is not known but certainly enough to place doubt on whether the system would would pass. Having come to the realisation that the initial base wall assembly was probably not suitable it was then necessary to come up with an alternative system. Test reports that I read suggested that additional layers of fibre cement board were not the answer. From an architectural perspective changing the wall construction has many non fire issues to be addressed. Will the proposed wall be weathertight, will it be durable, will it meet wind loadings, do we have a workforce that is capable of building something that is different, has it been tested? There are no easy answers to these questions. I looked at a number of systems that would likely comply with the fire requirements and for the purposes of the determination we collectively chose a system that would meet the fire requirements as well as suit the other factors relevant to the needs of the particular building project. The base wall assembly can be important, particularly if the exterior cladding material is not non combustible. ‎the cone calorimeter ISO 5660 and intermediate scale tests NFPA 285, and the Australian and British tests are screening tests to determine suitability of cladding systems rather than absolute tests of performance. The ISO 5660 being very crude and the others having more sophistication. ‎Considering the risks associated with building height and occupancy and how and where the cladding is placed on the building is probably a good starting point when selecting the appropriate test method to demonstrate compliance. ‎It is important to think holistically about how fire behaves and not limit ourselves to slicing up sections of the code to demonstrate compliance. Grenfell would be case in point of slicing up regulations to demonstrate compliance with a disasterous outcome. The determination being limited to a single building still leaves a lot of uncertainty for us. I have been speaking to both MBIE and Auckland Council and they are both working hard to provide more clarity on what is a complex problem. For CPEng engineers this probably comes under the definition of a complex problem which we need to gain or maintain our chartership, so a good problem for us to get our heads around. Thanks Mike, it is clear when you look into this that cladding fire issues are more complex and detailed than a first look indicates. As I recall in the determination, the inside wall lining was Fyreline as well as the Fyreline under the RAB. Was thie Fyreline inside because those walls needed to be fire rated for other reasons (limited openings, spandrels etc) or was that a requirement of the determination approval? It is not clearly stated. It has a significant impact on costs, time and construction detailing, especially for a reclad where you could add the Gib outside, but doing inside means stripping out apartments, removing kitchens, kicking people out into the street, etc. The lining on the inside of the wall was fire rated so that heat transfer through the wall from the room fire to the cladding cavity was low enough not to contribute to significant heat buildup and affect the performance of the cladding. While the Determination was for a specific building we were wanting some generic outcomes so I limited myself to showing equivalence with NFPA 285 which has all the external wall excluding the window fire rated. Conceivably there could be specific building geometry on a building that would negate the requirement for this. This would then be an alternative solution. And yes lining the inside wall of an existing building can be a big issue in existing buildings if there are kitchens on the external walls. May throw a spanner in the works for some ACP panels. The MBIE report refers to common construction having combustible material / insulation in the cavity and no fire blocks as a reason the Codemark is not valid. My experience is that I haven’t seen insulation in a cavity (between the rain screen and RAB) in NZ - ha anyone come across this? It was part of the issue with Grenfell. These days at least, there are interstory fire blocks to complete the fire separation - I do agree that this has been missing or poorly documented in the past. This is aside from the question of is fibrecement RAB suitable per the recent determination above. I have heard anecdotally from a few architects and fire engineers that because of this determination, current building projects which use RAB on timber framing now require a layer of fire rated plasterboard between the RAB and the framing which is a major headache in terms of buildability. This is the conclusion I drew from Michael’s comments and reading of the determination. Would it be prudent for all of us to specify this now? at least until further guidance is forthcoming from Council/MBIE? Noting also Michael’s comments regarding building geometry, but also the requirement of C/AS2 2.3.9 c) for two way fire rating! Surfing the internet instead of doing paying work, I came across this which might be a useful resource. Note there are differences between NZ and US building codes and acceptable risk levels so approach the results with caution. The EFFECT site is at EFFECT - you will need to sign up for a NFPA account. Its free and lets you read the NFPA standards online so get one anyway. 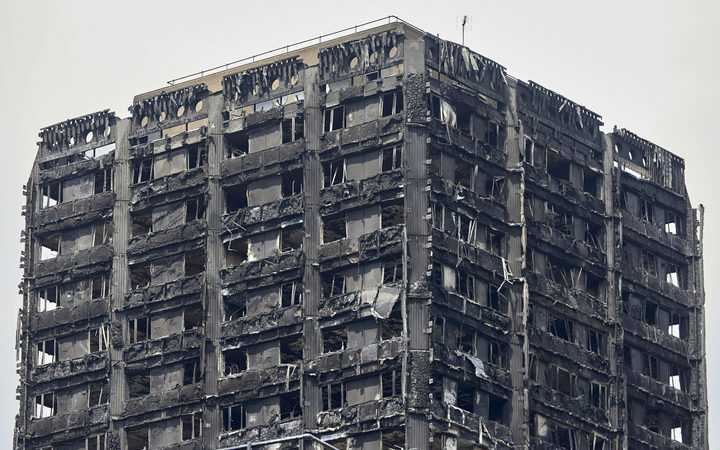 Building owners and designers are struggling to deal with the suspension of key approval certificates for aluminium panels similar to those that burned on London's Grenfell Tower. Here is an interesting North American article written in 2015 on the perils of unregulated cladding systems and also provides some comments on the dangers of placing too much reliance on sprinklers to mitigate cladding non compliance.